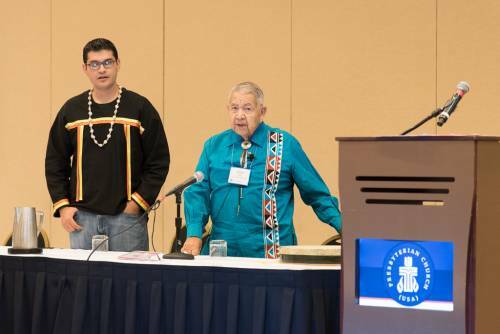 LOUISVILLE – The Presbyterian Mission Agency Board (PMAB) opened its Friday meeting with a Native American Day Worship service led by Elona Street Stewart, executive for the Synod of the Lakes and Prairies, and board members Jason Chavez, Cecil Corbett and Buddy Monahan. A song by the Thunder Bird Singers, family members of the late Elizabeth Hale from the Shinnecock Presbyterian Church, invited worshipers into the service: “My heart is calm, big waters sing, pray my morning song,” the refrain proclaimed. Following worship, the PMAB was led in a cultural humility “Blanket Exercise” exploring the tenets of The Doctrine of Discovery, the 1493 papal edict promoting the appropriate of land and subjection of inhabitants of that land during the era of European exploration. Part physical experience and part history lesson, the exercise raised awareness of the systemic and systematic process Europeans, the U.S. Government and the church used to steal land, separate families, forcibly take children from parents to boarding schools, and murder hundreds of thousands of Native Americans. The exercise evoked strong emotional feelings as the group expressed their thoughts and responses to the realities of the treatment of Native American people. There are 562 federally recognized tribes on reservations in rural areas, allotment land and in the cities of the United States. There are 95 Native American congregations within the PC(USA). Most congregations have been in existence for 100 or more years. The Native American Congregational Support Office and the Native American Consulting Committee work collaboratively on issues related to Native American ministries. The Native American Congregational Support Office is available to assist synods and presbyteries, congregations and others in developing a partnership for new ministry with Native Americans. For more information contact the Rev. Irvin Porter, associate for Native American congregational support. 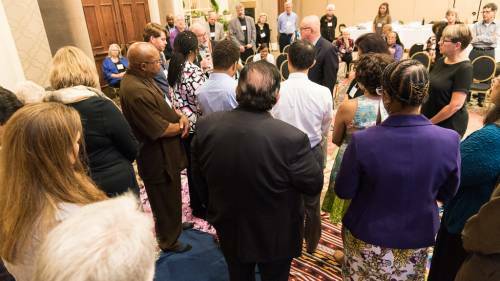 The latest edition of Facing Racism, a collection of resources from the Presbyterian Church (U.S.A.) addresses The Doctrine of Discovery and the church’s response.